Imagine having to suddenly flee your home, without warning, the possibility of never returning again. You are immediately on the run with the sound of screams, bombs and gunfire in the background, a quick headcount of your family they are scattered, some at school, others at work, how do you get hold of them?. Where do you run to, where do you hide, what do you carry with you? You cannot carry the home theatre system you are still paying for, that pot on the stove will have to remain where it is, even if you remember to carry your phone charger what use will it be, you are on the run. This is of course an experience the majority of us Zambians have never experienced having been born in blissful peace and becoming so accustomed to it, that most of us take it for granted often toying with the notion of civil strife as can be seen in the battles of the key-board warriors or online-politicians who continuously threaten each other on popular social media just because they belong to rival political parties or different ethnic groups as has become the recent trend in Zambian politics. Nevertheless as Zambians we can only imagine what it feels like to be displaced as George Muzamba of Kamwala South in Lusaka is doing through paintings dedicated to displaced peoples and exodus of refugees. “For about two years now I have just been playing around with this issue of refugees. 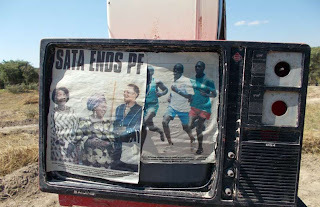 The images that I see on TV touch me and I always think this is sad, why should such things happen to people, these are families, women and children, what next for them,” laments Muzamba who is an avid follower of African current affairs. He confesses that he has never seen a group of refugees first hand but is aware that ever since the 1960s, Zambia has been the second home to countless refugees especially during the Kenneth Kaunda-led liberations struggles of Southern Africa, once harbouring the likes of former South African president Thabo Mbeki and Robert Mugabe. “You see what really pains me is when I try to put myself in these peoples shoes, I think look, these are human beings just like me, yes refugees are human too,” he says. Addressing top government officials, members of the diplomatic corps, representatives from the refugee community and the press, Lo Castro emphasized that if people adhered to this year’s theme and personally got to know least one refugee and took time to listen to their individual stories, problems such as discrimination and xenophobia would not exist. “Here in Zambia people have luckily continued to enjoy prolonged peace and stability and a sustained open door policy that since decades has welcomed refugees fleeing conflicts and persecution. In addition, the Government of Zambia has recently allowed former refugees - who have spent 20 and more years in the country and are unable or unwilling to return to their home country - to remain legally in Zambia,” stated Lo Castro. 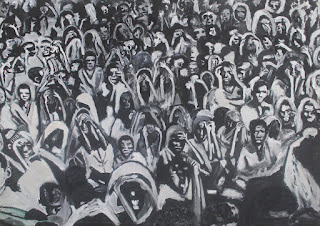 Nevertheless, in the painting Refugees 1, Muzamba fills a large canvas from end to end with a sea of people, they appear seated on the ground most resting their heads between the palms of both hands in despair, the group seems to be waiting for further instructions or placement. You cannot tell out their individual faces, maybe because you are not supposed to. And to enhance the feeling of sadness, the artist decided to use a monochromatic aesthetic, of greys and black which conceivably adding to the gloom, enhancing the image’s reflection hopelessness and misery. 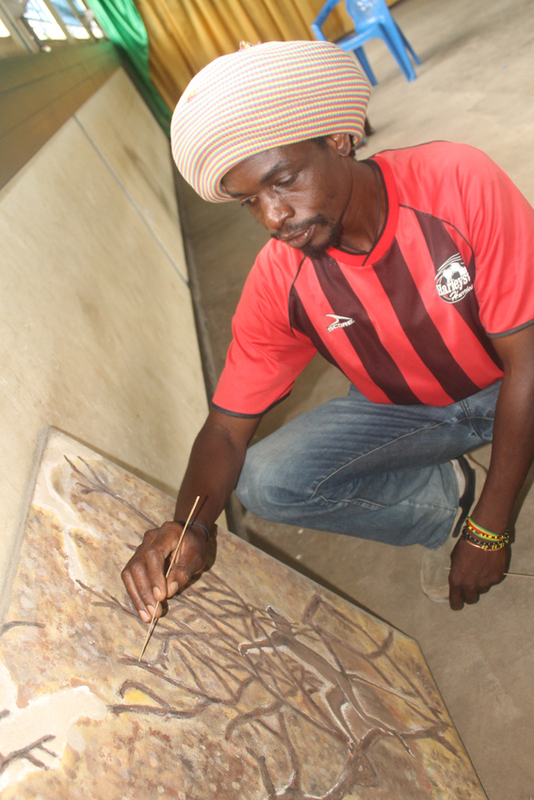 At 39, Muzamba has not yet shown his work in a gallery and by art world yardsticks, this makes him a late bloomer. He has been a self-taught sign writer adorning market stalls around the capital from as far back as he can remember but, encouraged by his mentor Albert Kata head of the Kanyama Art Centre (KAC), Muzamba has been practicing with acrylic on canvas. He says his first works were imaginary scenes of wildlife, and he would even sell one or two although his main source of income has always been sign-writing. In fact, when there are no tenders on the signage front, you will find him at KAC working on his canvases. “I don’t think I can do the wildlife secenes anymore, even if they used to bring a bit of money here and there for now, my passion now is really with the refugees, this is what moves me, I really want to add my voice and tell the African leaders that enough is enough of these civil wars, people cannot be living on the run,” says the artist who is a dedicated member of the Rastafarian movement, believing in peace, love and harmony as well as adhering to the tenets of African emancipation hero Marcus Garvey of Jamaica and His Imperial Majesty Emperor Haile Selassie I of Ethiopia. Muzamba observes that as an artist who has only undergone informal training chances may be slim for him to get his work into a gallery or exposed internationally, but he has promised himself that this year, by all means he will take some of his work to the Henry Tayali Gallery in the Lusaka for the Independence Week exhibition in October. Undeniably, his work may not be top-of-the-shelf, but it is honest and unpretentious as he says, it comes from the heart. “I think I have the confidence now, I will just take my work, if it is accepted in the gallery then it will be a plus for me. Yes I need money, but even if they don’t buy it, my message on the situation of refugess has to get out there,” he says. He adds that the challenge he faces at the moment is the purchase of art material, he did not realize that the material used for studio practices such as canvas, tubes of acrylic and horse hair brushes can prove quite costly as compared to the paints and brushes that he uses for sign writing which can be bought at comparatively lower prices in the many hardware stores all over Lusaka. “But, art is what I love doing and I won’t stop, I was born to do this. It’s also a continuous learning process, what I’ve discovered with painting, the more you practice the more you get better especially playing around with colour, you get to understand how to control light, how to create the illusion of shadings and perspective you know,” he says. 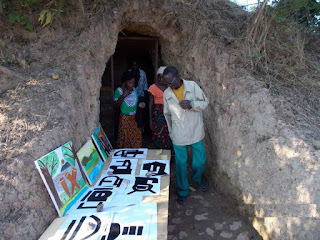 In his short experience he observes that since there are not too many galleries in Zambia, government should think of supporting artists like himself by commissioning them with commemorative murals to beautify the city on the walls of spaces such as the flyover bridge and the football stadiums. Muzamba also thinks the corporate support for the visual artists is not as good as that of musicians. “I am just a beginner but I have been watching for long time, (visual) artists never get the support. I am always at exhibitions at Henry Tayali gallery, I never see a pop up banners from MTN, Airtel or Barclays, but when it comes to supporting the musicians they are number one, I can’t say, maybe the artists don’t approach companies for support, I am not a member of the Visual Arts Council yet,” says Muzamba. Certainly, the artist does have a point with regards corporate sponsorship but also as he rightly interrogates, there is no telling whether VAC is making an effort to approach business houses for support. According to GroundUp, South African Police Services (SAPS) Western Cape Media Centre confirmed that during the operation counterfeit goods to the value of R150, 000 (approx. over K91, 000) were confiscated as well as substantial amounts of cannabis. 86 arrests were affected; 81 were undocumented foreign nationals, one was for possession of cannabis, three were for counterfeit goods, and one was for an outstanding warrant of arrest. GroundUp sent the authorities a set of questions that included: On what legal basis was the action carried out? 81 of the 86 arrests were for undocumented foreigners. How do SAPS and SANDF personnel know who is a foreigner? Since foreigners are not legally obligated to carry documents on them, on what legal basis can you arrest a foreigner for being undocumented?, Did SAPS have warrants to search the stores? How can people get their confiscated good back, especially since some storeowners allege they did not receive receipts for their confiscated goods? A response from Lieutenant Colonel Andre Traut, however, stated: "[K]indly be advised that Saturday’s crime operation in Cape Town was executed in terms of the Criminal Procedure Act, and any person who is of the opinion that he or she was unlawfully arrested or treated can address the matter by lodging an official compliant with authorities." 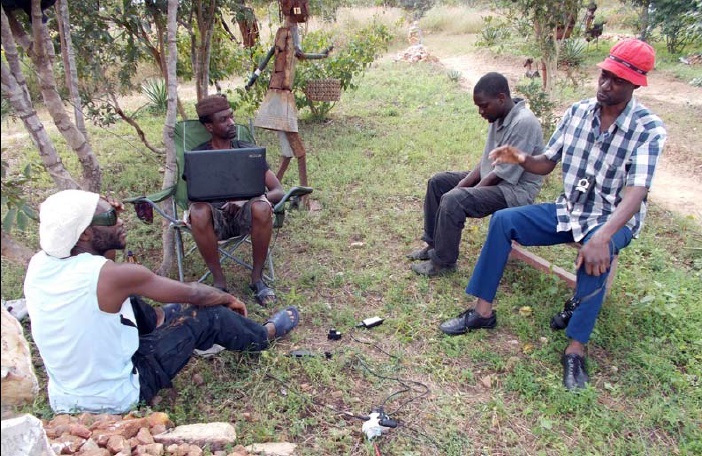 Operation Fiela, a project aimed at eradicating crime in South Africa has been described by a number of SA media houses as “legitimising xenophobia”. As hinted last week, artist and Zambia Open University (ZAOU) Senior Fine Art lecturer William Miko has been on something of an express train regarding his activities of late, but perhaps most notable, is his return to the studio as a practicing artist and subsequently exhibiting in a three-man show entitled Borderless Women, which opened on 8 March and ran until to 20 May 2015 at the Voksenåsen Cultural Centre in Oslo, Norway. He shares his experience of the Norway exhibition and how he managed to find time to paint when he was not marking student’s assignments, and as usual he also stresses how important university level education for Zambian visual artists. He stresses that this portrait is a hypothetical representation of that individual woman’s hard work and contribution to human existence. The exhibition also included a cluster of 10 small paintings called the African Orgasms series and most of the medium sized pieces on display were crowd scenes, as well as a new body of work which was inspired by folklore, that he calls the Anthropo-zoomorphic series. But what is perhaps most fascinating about Miko’s work is the production process, although viewers and collectors alike never get to experience this. His style is in fact a mark-making process and when you find him in full swing working on a painting, you hear the violent and almost primal scratches of a palette knife as it scrapes paint against the canvas either reductively or additively depending on what aesthetic he wants to achieve or perhaps depending on which direction the life-forces or his emotional state will guide him. 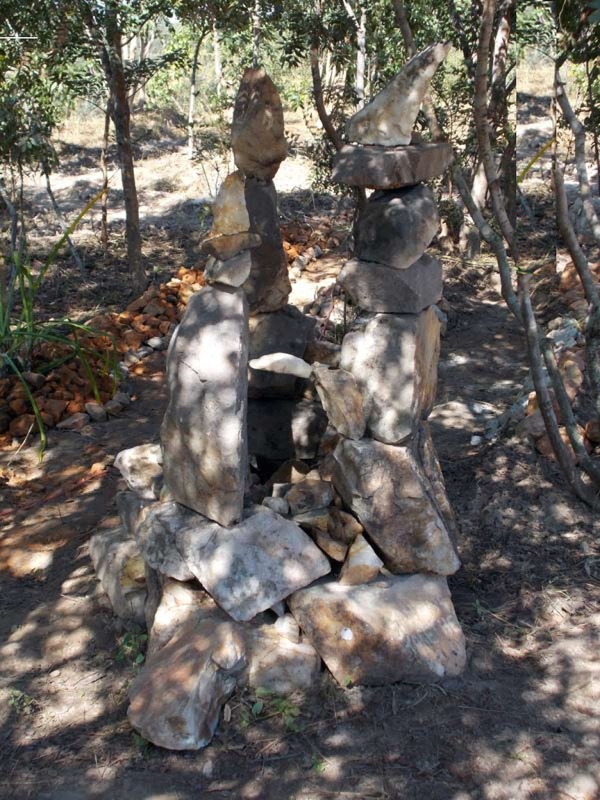 Many artists who work in passionate repetitive rhythms like abstract expressionists or stone sculptors, often enter in to trance-like frenzies spurting their creativity out in spasms something akin to the work of a mystic who is heaving what is within. 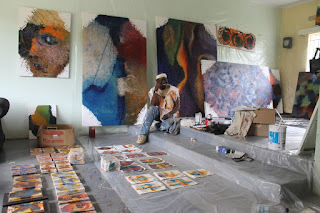 Interestingly, Miko indicates that when he is in an exhibition looking at one of his finished works on the wall, he can still hear the echoes of his palette knife scratching away at the canvas, for him, the creative process of a painting does not end in the studio, but follows it like a spectre. Nevertheless, contrary to the widely held observation that painting as a medium is dying out in Europe, Miko’s disagrees. “Painting is just a material of expression that the West has been using for centuries now, if it is less appealing or perceived to be so that is still a matter for debate. People out there and the rest of the world are still responding to paintings as a means of expression. We had a very good crowd at the opening: Among other guests were the likes of Norwegians who have collaborated and worked with Zambia, former ambassador to Zambia Terje Victel, and many others, Brit Botheim and Aase Marie from Kunstbanken, Prof. Michael O'Donell including long gone from Zambia artists such as Gemain Ngoma and Victor Mutelesha and my own brother Jerry and his family,” he says. He says this painting immediately attracted the attention of the Voksenasen Management and has since been collected and joins another large piece of his called The Journey that was purchased in 2006 and is displayed in the centres public foyer. “It is important that the value of artworks reflect consistency with one's development as an artist. Usually, I have no challenges in valuing my artworks as art does not depreciate and the value of art is usually aligned with career honesty and which is hypothetically constant,” he adds. Commenting on his passion to teach and the work he is doing at ZAOU, Miko shares his sacrifices, his vision as well as the everyday challenges he faces. “This personal commitment, however, comes with its share of advantages and disadvantages: to state the latter, its disadvantage is being compelled to work ‘26 hours’ (twenty six hours) a day, one has to find two extra hours to sleep. 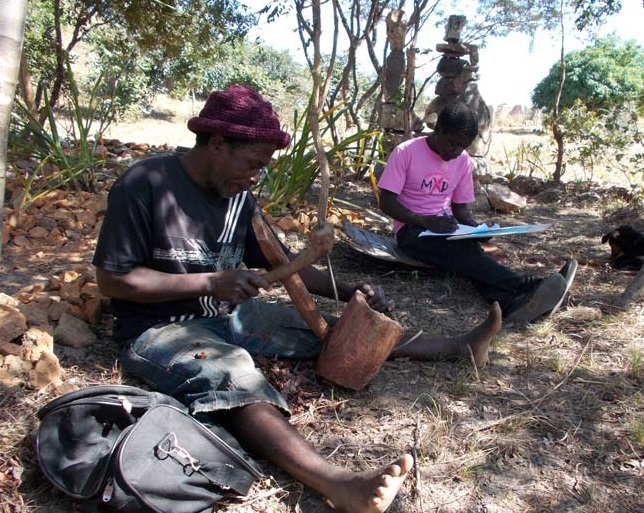 There are also implementation frustrations that need to be dealt with in actualising this degree in fine arts being the first of its kind since independence in 1964,” asserts the artist who is also Vice Chairman of the Lechwe Trust, a non-profit organisation that focuses on art scholarships and the collection of art by Zambian artists. He further suggests that educating Zambia’s creative citizenry and artists to university degree levels is inevitable if the country is to remain competitive in today’s global art world. He adds that ZAOU currently has over 100 (hundred) fine arts students on BA degree level of study and their enthusiasm and anxiety to learn is what compels him to carry on despite all odds. Miko is also the architect of a philosophy he has coined “correcting a national anomaly”, in reference to the long absence of an art degree in Zambia and the general deficiency of art education. The philosophy attempts to respond to these questions. Born in Mwense, Zambia, in 1961, Miko remains an artist and arts ambassador with an international reputation. He holds a Masters Degree in Fine Art (1999) from Middlesex University, London, UK and has conducted public lectures on art in Zambia, Nigeria, France, Switzerland, Sweden and the United States. He lives and works in Ibex Hill, Lusaka. Artist and Zambia Open University (ZAOU) lecturer William Miko has just returned from a trailblazing trip to Europe where he was invited to officially open a solo exhibition by internationally acclaimed Ghanaian sculptor El Antasui. Anatsui, 71, who was recently bestowed with the Golden Lion for Lifetime Achievement by the zenith of global arts events, the Venice Biennale, was also present for the opening on 23 May at the Kunstbanken Art Centre in Hamar, Norway. Preferring non-European-based artists or curators, project manager Aase Marie Brun states they invited Miko to be the key moderator at the opening and to oversee the question and answer session because the centre decided on someone who lives in the same reality with a deeper understanding of the art world seeing that both Miko and Anatsui live and work on the African continent. Miko was also on hand before the opening to take part in the mounting process of the exhibition. Anatsui whom Miko describes as being of humble character is perhaps the biggest artist to come out of the African continent to date. His works are on unceasing demand and have been collected by centres, from the British Museum, London to the Centre Pompidou, Paris; the de Young Museum, San Francisco, USA; the Metropolitan Museum of Art, New York; Guggenheim, Abu Dhabi; Osaka Foundation of Culture, Osaka; Museum of Modern Art, New York as well as many other prestigious institutions and some of these individual artworks fetch well above US $1 million – yes you read correctly – more than one million dollars per piece. Despite his extraordinary success, he is an artist that has gallantly refused to relocate to the west, preferring to remain rooted on the African continent; this is a fact that more than anything else – by these books -- elevates the West African master to the status of an African hero, loyal to the soil. Art historian and professor at the University of California Santa Barbara, Sylvester Ogbechie in an essay entitled The Curator as Culture Broker: A Critique of the Curatorial Regime of Okwui Enwezor in the Discourse of Contemporary African Art aptly points out that: “Anatsui’s success positions Africa as a significant locale in the global discourse of contemporary art.” And in 2013, the artist triggered the headline “African contemporary art is hot,” when the Financial Times UK announced that the London auction house Bonhams achieved a record US $850,000 for one of his works. The same year The Royal Academy of Arts, London, presented him with the prestigious Charles Wollaston Award for his work, and in 2014, he was made an Honorary Royal Academician as well as elected into the American Academy of Arts and Sciences. 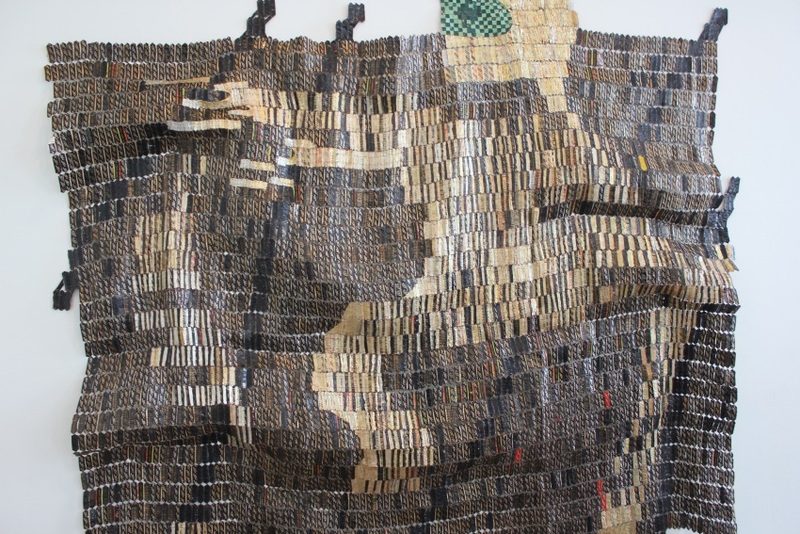 In his formative years, Anatsui was known for using a chain saw to create sculptures through scarring and charring wood, but of late he has become famous for gigantic wall hangings that are made mainly from discarded bottle tops. Some of these are so huge they are able to cover the entire façade of a large building. In appearance most of these works resemble the colourful kente cloth of his native Ghana, and he also incorporates various traditional motifs in his work too. Despite all these lofty accolades, achievements and a remarkable life long career, according to Miko, the artist remains an exceptionally humble man. 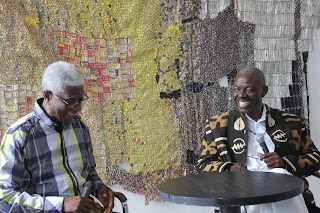 “The man, El Anatsui is so humble that you would not pick him out of a crowd. It is his humility that to me is greater than all that he is known for. For example, he exhibits all over the world in highly prestigious spaces but is down to earth and still places humanity at the centre of life,” he says. Miko explains that for the ongoing show Anatsui’s exhibits were delayed in transit but he was so calm about it and went round comforting everyone that they should not worry all will be well, and indeed the crate arrived in time for the mounting. “As we were mounting the show, El would go up on the ladder to hammer a nail in the wall or to create a desired fold in the sculpture. The man is 71 years old, who on earth would expect him to do that, but El is El, simple and humorous. 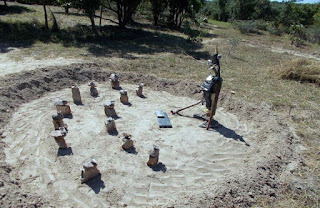 “Even when I suggested we switch three sculptures around from his original plan to suit one challenging space, he just said ‘Yes William you are right, I think I will be asking galleries and museums around the world to invite you from Lusaka to help display these sculptures whenever they are not sure of how to do it, especially if I am not able to go there myself’, and he laughs about it,” he says. Miko adds that the discussion he coordinated was insightful and both the audience and Anatsui raised pertinent issues that are key for reflection with regards the classification of contemporary art on the African continent and beyond. “There was a question from the audience asking whether El as an African artist of his stature felt responsible to represent Africa and its traditions around the world, he just said no. He said he doesn't ascribe to the categorisation of art or artists, art is art regardless of where it’s coming from. If anything the Western canon needs to be on a lookout because there is so much new ways of making art which is coming from places it has since ascribed as the other. Art historians need to open themselves to the new dynamics of what is obtaining in the periphery. Good art can come from anywhere,” recounts Miko. Nevertheless, Miko’s renewed connectivity to the mainstream and often inaccessible high-level conventions of contemporary global art practice should be commended as it may not just profit himself but may prove beneficial to the ZAOU, his art students and by extension the Zambian art scene that has for a long time been thirsting for a global breakthrough, a real one, not the bantering recently experienced through the embarrassing Imago Mundi book project of which he was also involved. In short, being in Anatsui’s line of sight must surely be a good thing. Miko also highlights that during the artists talk, Anatsui indicated that he was open to invitations from across the African continent and would be glad to come to Zambia and share his experience if either he or the ZAOU were to extend such an invitation. We can only hope for bigger, better things to come. Of late, Miko has been on something of an express train. The Anatsui outing was his second trip to Europe this year, he was also there in March during the launch of Borderless Women, an exhibition in Oslo at the Voksenåsen Cultural Centre which featured Miko’s recent works alongside Jamal Ahmed from Bangladesh and Narek Aghajanyan from Armenia – read about this next week -- and no sooner had he returned than he jetted off to Johannesburg as one of the International Adjudicators for the Barclays L'Atelier, one of South Africa's most prestigious art competitions that for the first time in its 30 year history opened to Botswana, Ghana, Kenya and Zambia. Meanwhile, Miko’s hosts, the Norwegians are not new to collaborating with Zambia, this recent development appears to be a revitalisation of old ties. In 1999, Norway hosted an International Women's Conference whose theme focused on women entrepreneurship and to commemorate the occasion the Kunstbanken Centre held an exhibition of Zambian female artists entitled Women Show the way that featured Agnes Buya Yombwe, Vandita Varjangbhay, Tessie Lombe, Silvia Mwando and Julia Malunga. Would it not be a nice thing to see the Centre host the explosive new crop of female stars such as Nukwase Tembo, Gladys Kalichini, Mulenga Mulenga, Sarah Chibombwe and teenage sensation Alina Mateke who is progressing well in the second year of her BA (Fine Arts) at Armstrong State University in the United States?. Voices of Colour, the ongoing exhibition at the Zebra Crossing Café, Ababa House in Lusaka, brings together a vibrant band of artists coming from a diverse range of backgrounds as kaleidoscopic as the paintings they have on display. Each of them have personal credentials, artistic styles and thematic content so unique from one other that this is what actually gives the exhibition colour or character as it were. The seniormost among them Jack Menke, is an HIV/tropical medicine specialist by day and a painter by night. Mapopa Manda, 33 is a politically astute mixed media artist with a witty yet astute political commentary that focuses on local and global issues and also comments on anything ranging from social injustices to popular culture and corruption. 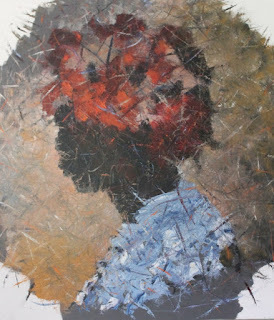 Montfort Chinunda, 23 is the restless young talent among them, always seeking out new ways to express himself in a representational vocabulary that is heavily accentuated by abstract ornamentations. Last but not least is the lady of the group Gladys Kalichini, when she is not busy putting her University of Zambia Economics degree to good use doing some number-crunching at a leading telecommunications company, the twenty-something-year-old is busy dabbling with paint. Egg-shaped characters that slightly gaze away from the viewer with wide eyes have become Menke’s signature, the subtly forlorn expressions on their faces are at times hard to read there is no telling whether they project sadness, happiness, or both, this ambiguity is buffered only by the infectious warmth of the artist’s pallete and the cartoon-like appearance of the subjects. 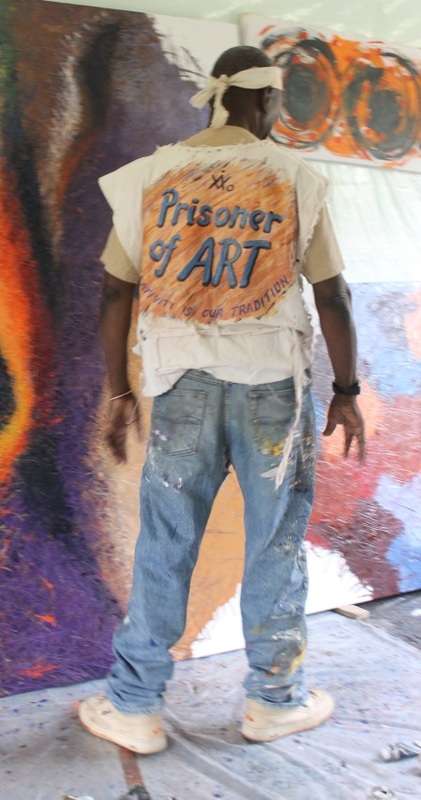 “I see myself as a painter and an AIDS activist. My work as an AIDS activist is all around (the acceptance of) Anti-retroviral treatment with the artist collaborative art4art. 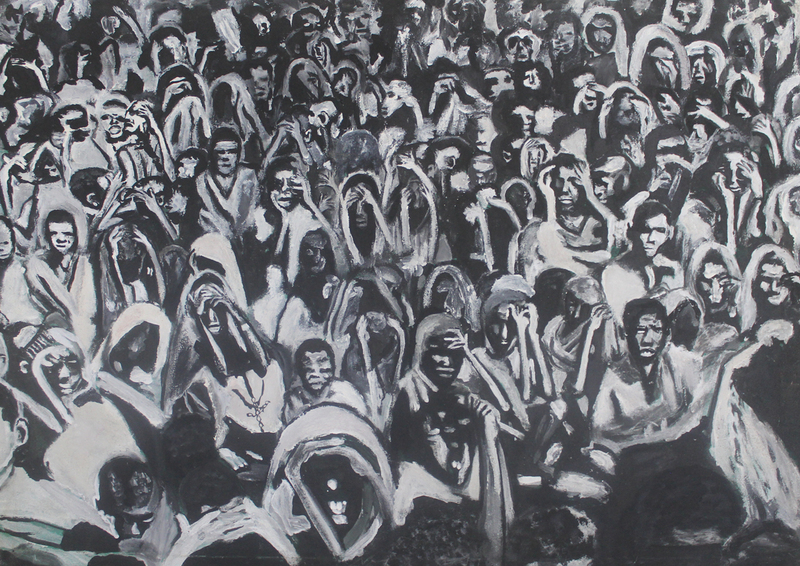 Art in my opinion can be used to clarify or promote discussion about social issues of any sort. 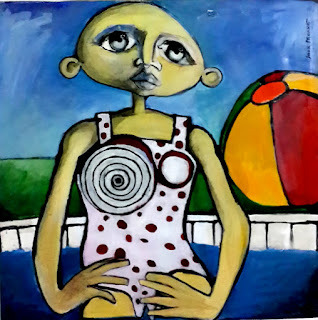 Art4art was registered as a Zambian NGO in 2009 and has organized several exhibitions on the subjects of HIV stigma, adherence and antiretroviral treatment (ART),” stresses the artist who is also Technical Director at Elizabeth Glaser Paediatric AIDS Foundation in Lusaka. “I greatly admire the art of the insane, prisoners, children, and primitive artists. Children are close to the sources of creativity and create free of models or previous examples. In my own work I strive to achieve a similar untutored simplicity, often by employing intense colours and by line drawing in an unstudied manner uninfluenced by convention. One of my aims as an artist, is to "make secret visions visible”. 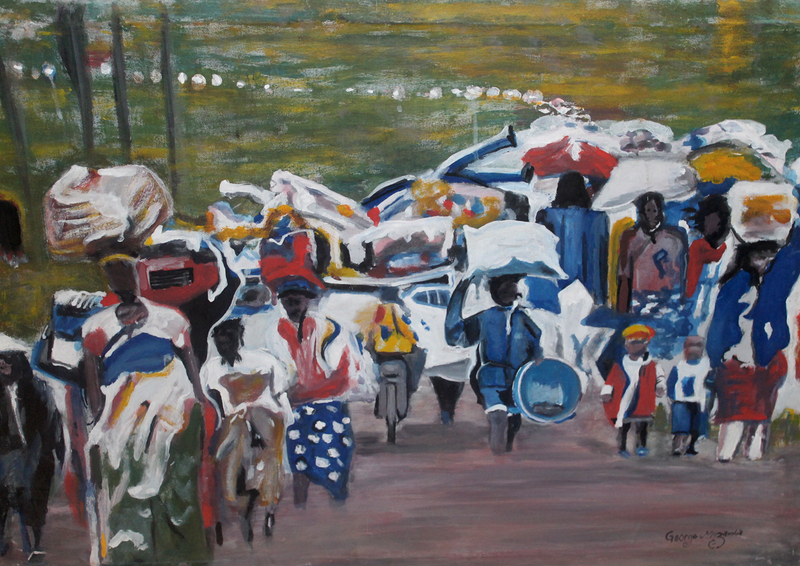 Although the Netherlands-born artist has been in Zambia working as a medical practitioner since 1998, he has only been exhibiting consistently on the Lusaka art scene for the past five years. He was also a key co-ordinator during the construction of Anti-Retroviral man a large scrap metal statue that was mounted at the Lusaka National Museum in 2011, an ode to the fight against stigma. Apart from his medical studies, Menke obtained an MA, Art History from the Universiteit Leiden in 1991, in his final thesis he examined the Russian Cubo-futurist opera (1913) "the Victory over the Sun" by Malevich, Kroetsjonych, Matjoesjin and Chlebnikov. 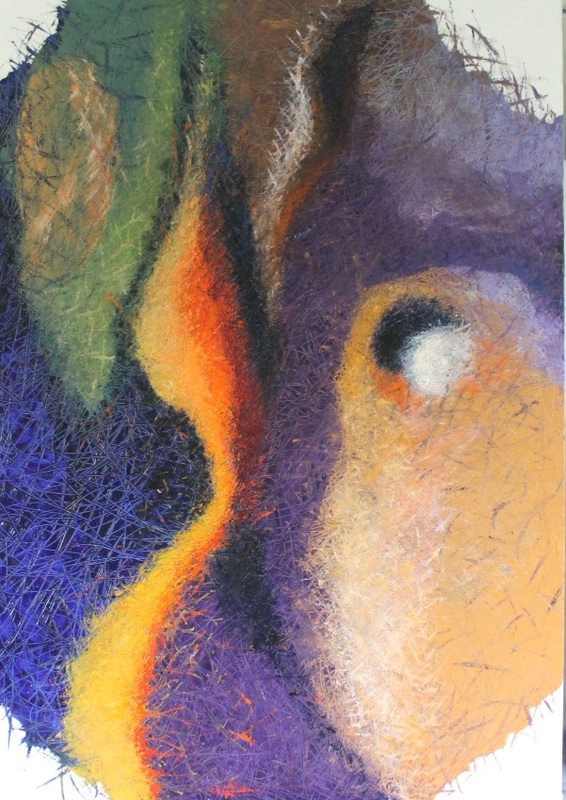 “I find the inspiration for my work in my classical art education and my work as a Tropical Medicine specialist. I try to combine these sources into art that makes you smile out loud. 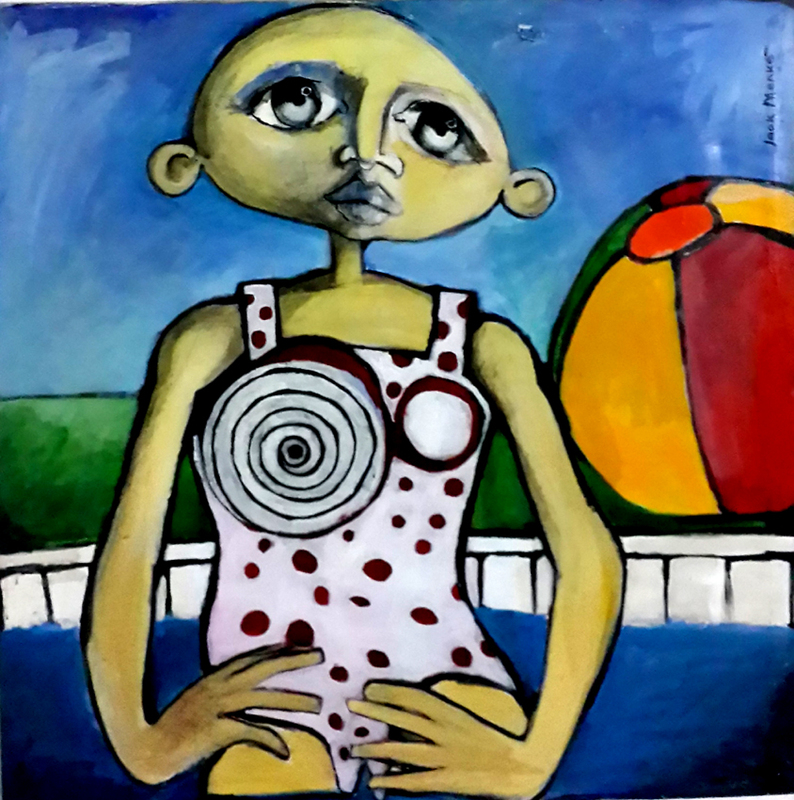 My work is influenced by my favourite artist from the renaissance Jacomo di Pontormo, and modern masters such as Paul Klee, Jean Dubuffet, and Jean Miro,” states Menke whose favourite haunt has been the Art Academy without Walls (AAWW) in the Lusaka showground’s since 2007. Manda’s work, while as colourful as Menke’s is on a different thematic plain as earlier mentioned. But although the fellow AAWW and Art4art artist still maintains his politically steeped paintings, he appears to be more meticulous in the detail of his magazine and newspaper clippings, both in the use of the images and headlines that he chooses to paste into his paintings. He seems to be advancing the style as far as he can and in his own radical way keeps gnawing at the heels of the politicians and while it can be argued that most Zambian politicians may have no interest in art at all and perhaps never attend exhibitions -- yes including the so-called honourable Minsters and permanent secretaries whose job it may be to do so -- he appears resilient an continues with his messages. Chinunda, or Monty as he is fondly called has been practicing art from as far back as he can remember although strongest memories of his foundation are rooted in his days at Kalomo High School where the National Theatre Art Association of Zambia presented him with the District Junior Theatre Art Festival Award. Like Menke and Manda, the Kapiri-Mposhi-born artist also calls the AAWW his studio space and he too expresses himself in vibrantly bold colours. “I create a deliberate push and pull between near photorealistic detail and my own vocabulary of visual glitches that challenge the very realism. 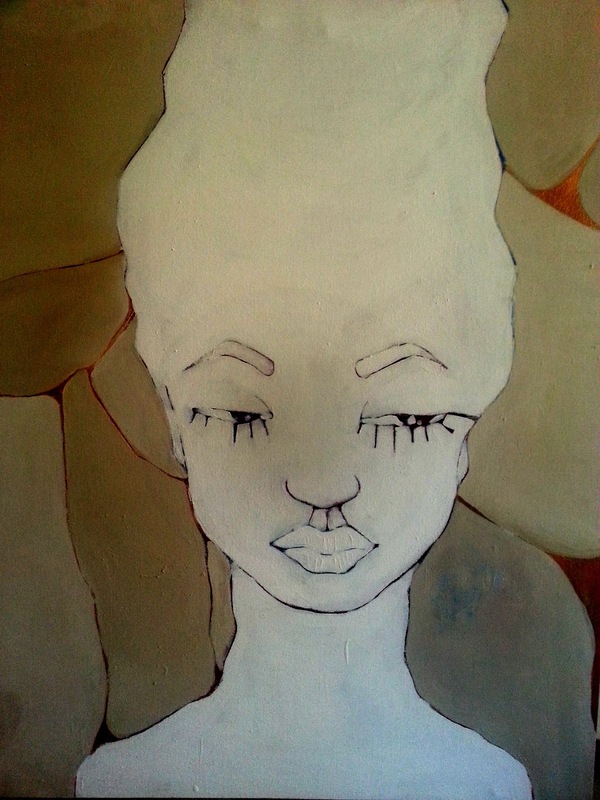 I paint and draw to remain wholly representational while functionally abstract. 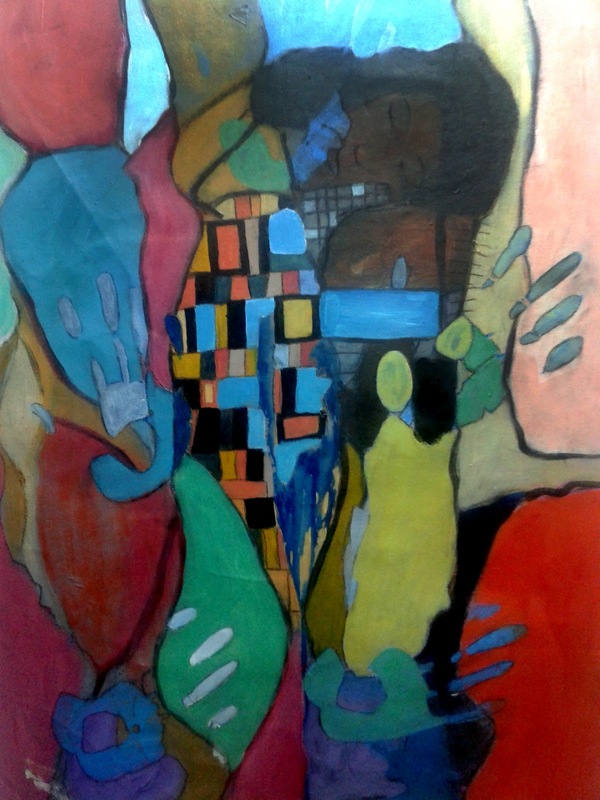 This duality is central to my work and allows the figures to evoke emotions with or without defining them,” states Monty who is now a staple at the Zebra Crossings shows, his style remains consistent and echoes the few years spent under the highflying Zambian painter Stary Mwaba’s apprenticeship. Kalichini on the other hand appears to be the odd one out in this quartet, of course not because she is the only woman in the show, but she is the one with the coolest pallete. The coolness of her tertiary blues and delicate greys have a subdued aura compared to the work of her colleagues and this calmness of colour is perhaps matched by the expressionless faces of her subject matter, case in point the huge panels in her 2015 'Evolution series'. Also very visible in this body of work is her bold use of line, where she creates sharp edges that almost translate into silhouettes when coupled with the colour play. Kalichichini is particularly fascinated by topics of social imbalance in the third world and her background in economics, and the many graphs with clean repetitive lines that she deals with at the office creep into her studio work. “I thought it would be interesting to do a lot work with black and white hues for this show. The contrast against the other artists' work would be very interesting in my opinion. To evolve the concept of colour in African paintings not just being the occasional earth tones. The idea of using colour, or the lack of it to evolve some of my already existing work, and see it in a different light, in a more simplistic nature is what I find intriguing, as well as making the images almost as timeless as the very idea of black and white,” explains Kalichini. Practically a self-taught artist apart from interaction with more experienced artists, she has come a long way and in the process has managed to bag two Ngoma Awards, in 2010 and 2012 respectively. Along with Manda and two other young Zambian artists, Kalichini is scheduled for the Àsìkò: 5th International Art Programme, a competitive 30 day workshop in Maputo, Mozambique towards the end of this month. Organised by internationally acclaimed Nigerian curator Bisi Silva, the founder and artistic director of the Centre for Contemporary Art, Lagos, the workshop is aimed at providing participants with “access to experienced local and international artists and curators,” provide “One-to-one individual portfolio reviews and feedback about participants work, encouragement of developing new contemporary practices on the African continent, sharing knowledge through curatorial lectures, artists’ presentations and critical debate, help develop new ways of creative thinking by integrating new elements such as performance, installation and sound projects as well as foster networking opportunities”. It is in fact the 2014 version of these workshops that perceivably lead to Stary Mwaba being selected as the only artist from Africa for a grant by the KfW Foundation to work and exhibit at the Künstlerhaus Bethanien in Berlin, Germany for a period of 12 months last year. For the four Lusaka-based artists that will attend, this is without doubt a big deal. At no time in the history of contemporary art in Zambia has such a group of energetic youngsters had the opportunity to go and receive international coaching over a 30 day period. These are things that only happen to footballers, but unlike footballers this team is sponsoring itself and will not be using tax-payers money, so technically they do not owe Zambia anything. However, they will be doing the local art scene a disservice if they do not return to share what it is they gather. This does not necessarily mean they should be compelled to hold classes and workshops. There is much that can be learned from them if what they acquire trickles down into their work as artists. It will be interesting to see if they will make the bold decision to become “real artists” for lack of a better term and not confine themselves to being the soft-focused, “chocolate-box” Zambian artists so beloved by penny-pinching expatriates that are known to haggle for high-end gallery art as if it were Sunday market curios without considering the materials used, the status of the artist and the conceptualization of ideas that went into the work, often taking advantage of artists’ hand-to-mouth existence. It would be interesting to see Manda and Kalichini return and push their conceptualization to the next level. The so-called global art world – assuming it is what they want to permeate -- demands that work be more theoretical which brings us back to the ongoing exhibition. Titles and themes should never be taken lightly. It is one thing to throw together some colourful paintings and name the exhibition Voices of Colour and declare it a “colour themed” show, but colour in itself has many voices beyond a bunch of pretty images and these voices have even deeper meanings depending on the vocabulary. So as a concept, colour has many meanings, perceptions and of course voices. But as for now you can go and enjoy the ones echoing in Voices of Colour which will be showing until the beginning of July. The Zebra Crossing Cafe Restaurant, is on the corner of Twikatane Road off Addis Ababa Drive, Lusaka as you approach the Manda Hill footbridge. 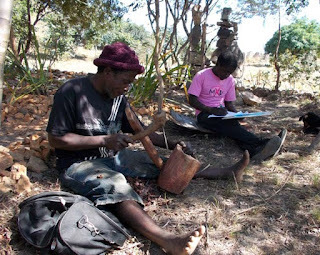 This year’s unprecedented upsurge of creativity on the Zambian art scene does not seem to be slowing down at all as the inaugural Harvesting Workshop hosted by the Mutale Kalinosi-led Munandi Art Studio (MAS) in Chongwe District, adds wood to the fire. Designed in the form of a one-month artist’s residency, it was organized for the sole purpose of bringing artists together to share collaborative conceptual ideas for future projects, an incubator for creativity of sorts. According to Kalinosi, the workshop, that is pegged to be an annual event was scheduled to take place in October last year but could not take off and was postponed twice because MAS was waiting for a response from the National Arts Council of Zambia (NAC) concerning a grant request that was eventually unfruitful. The artists finally had to dig deeper into their own coffers to get the ball rolling and the event took place in the month of April. He says while the postponements may have led to the low turnout and only 7 artists were in attendance instead of the 15 that were expected, artists still participated in a robust exchange of ideas and unbridled creativity, exploring themes ranging from parliamentary politics to colonialism, all expressed by means of conceptual art using mainly found objects. “Our main objective is to create a culture of realizing and developing ideas together, and by changing the mind sets of people in our communities. Move them away from this culture of selfishness and working in isolations. “A culture of developing ideas together can bring sustainable developments in our communities. We are using art as a source to spark off that idea. The development of the world lies in the hands of the artists, also in Zambia, working together is a taboo, so we are using Munandi Art Village as our lab for experimenting with our ideas as artists,” explains the 43-year-old who has had his fair share of international exposure having exhibited in France, Poland, South Africa, Sweden, India and Brazil over the past 10 years. Although it appears MAS has not been too active, it was established in 2004 as a result of Kalinosi’s completion of a two-year artist’s residency at the acclaimed Royal Academy of Visual Arts popularly known as the Rijksacademie in Holland. 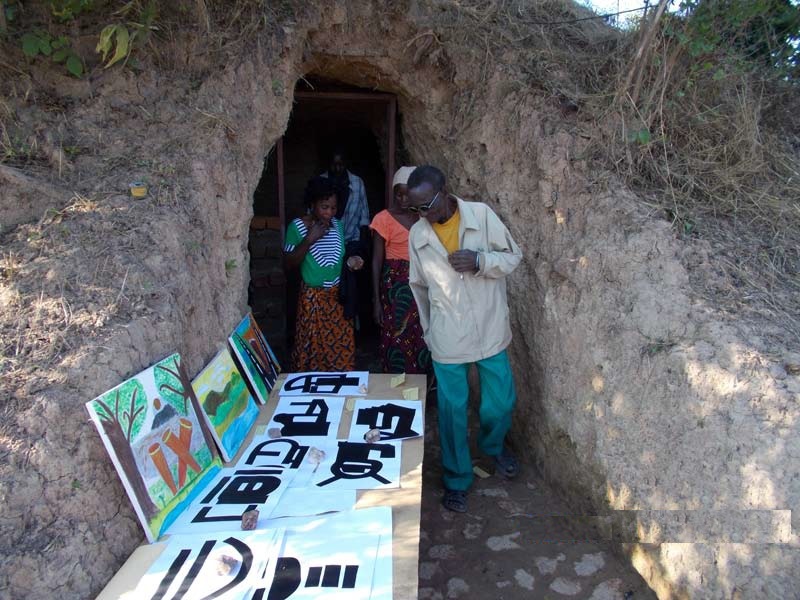 The Munandi Art Village however, is an entirely new space in the Kanakantapa area to be specific, Shyala Village that is expected to provide a two hectare camp site where artists can “develop their ideas in a quite environment away from the noise of the city”. In future MAS hopes to build some long-lasting structures and thatched chalets. “From the experience I gained in Europe. I thought of bringing a new independent platform conducive for artists to create art, but also in Zambia artists are stuck with the 14th century type of art, using brush and paint on canvas or chisel on wood or stone,” argues Kalinosi. Of course he may sound slightly fanatical with that statement because brushes and paint as a means of art production is still very much at the core of art-making even in 2015. But then it should be understood that Kalinosi belongs to a radical group of Zambian artists whom at the launch of their careers, with European exposure, in the early 2000s produced some extremely unusual works that were not entirely appreciated in Zambia. “Yes, painting is still accepted in the west, but the audience and the artists don’t treat it as the only media someone can use in order to express oneself artistically. Unlike here where all the upcoming artists are sculptors or painters, even the audience to accept you as artists, first of all you need to be good in portrait painting. In fact painters in the west are even finding it difficult to penetrate the art scenes, like Museums and galleries,” he claims. He maintains the art world is moving so fast such that painting has failed to catch up with the pace at which it is moving and that realistic or representational painting is contesting photography in a losing battle. He believes the camera has taken over painting and most paintings end up in living rooms as decorations instead of being in the archives. “I’m one of the very few conceptual artists in Zambia, because the culture we have developed in this country is slow to change in everything not only the artists but a nation as a whole. Someone saw my works and said in my face that, this is westerner’s art, and I asked him to show me the Zambian art, he pointed to a painting on canvas. “But the westerners have been painting on canvas since 14th centuries. So you see how we are slow in changing. You change the subject on the canvas and you call it Zambian art and other forms of art are not art? Stretching and painting using brush or palette knife on canvas were used by artists like John Constable until the camera was invented,” he says. na Haloba who is currently based in Norway. Konse Kubili (which can loosely be translated as “both sides” in the Bemba language of northern Zambia) was misunderstood because of the radical nature of the work which can be classified as conceptual art or conceptualism. To an audience that has for a long time been accustomed to paintings, drawings and sculptures, art in which the concepts took priority over conventional aesthetics was a non-starter. It can be argued that the negative response from the audience and fellow artists forced the two artists in to creative exile. Kalinosi would spend the next decade showing in Europe whereas Anawana eventually decided to settle there, launching a successful career having graduated from the Oslo National Academy of Fine Art with a degree in 2006. She has enjoyed several important commissions in Norway and in 2008 she featured in the 53rd Venice Biennale, the zenith of art expositions, at the age of 29 and she remains the only Zambian to have featured in this prestigious event considered the World Cup of the visual arts. Like Kalinosi, much of Haloba’s work is performance-based video and sound installations and occasionally using their own bodies as a medium. Nevertheless, it turns out the participating artists at the just ended Harvesting Workshop went flat out in the use of non-conventional media. 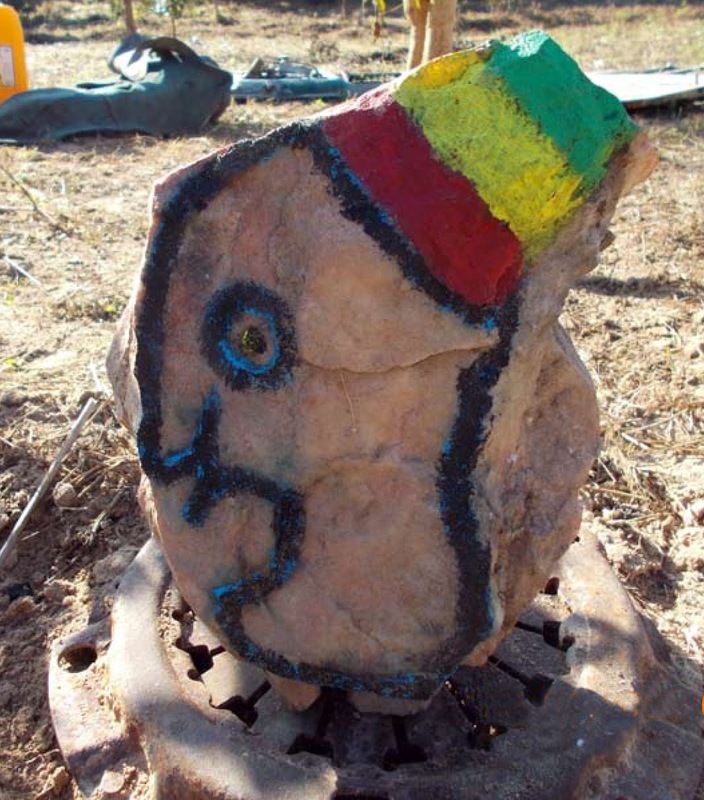 Gallery nurtured artists such as Danny Lwando, a painter and photographer left his comfort zones and came up with a non-permanent work entitled Mr Speaker using rocks, found wood and sand. 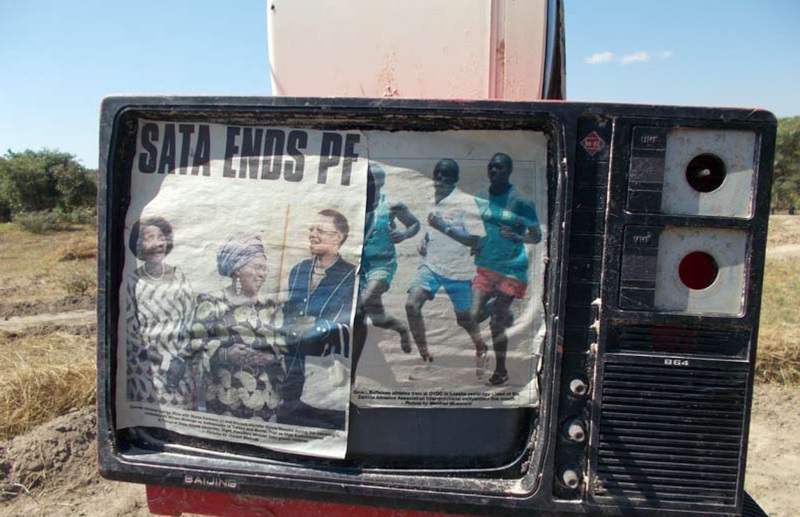 Kalinosi and Joseph Shakulipa produced Ship on the Mediterranean a conversation piece that explores colonialism and modernity using everything from cut out newspapers to discarded television sets. However, as much as Kalinosi may have a point in the need for artists to embrace new media and forms of creative expression, in an environment like Zambia where special grants do not exist for the promotion of works in this medium, conceptual art should remain something just for creative sparring and intellectual isometrics. Let us be honest, works such as Mr Speaker and Ship on The Mediterranean will not put food on the table, not in Zambia where the production of art remains pretty much an issue of the tummy. Therefore, paintings, drawings and sculptures will remain a very safe practice. Besides, even in the west these forms of creative expression remain a favourite particularly among investment art collectors whom it appears are continuously veering towards the African continent. Anyway, if a time will come when brushes will be thrown away, it is certainly not soon. This is the age of 3D cinema but people in the so-called west Kalinosi speaks of still flock to the theatre to watch dramas as they did in Classical and Hellenistic Greece over 2,000 years ago. It is the age of Auto-Tune and digitally enhanced music but they have not thrown away their violins and they still flock to the orchestra concert halls to listen to Vivaldi’s The Four Seasons, even though it was composed 300 years ago. If anything the Zambian public is still being force-fed “conventional art”, there is still time to feed them conceptual art, spoon by spoon. Kalinosi and team have not yet announce the exact date for the next workshop, but it is pegged for some time in April 2016 and a call out should be made to artists soon, participation fee is only K50, 000. Despite their inability to directly support the workshop this time around, NAC officials did show up at on open day to view the works alongside members of the general public. The project was also supported by a Judith Hall and Sue Hunt from the UK who provided art supplies and the Insaka Artists Trust offered camping tents and mattresses .All in all the Munandi Art Village is yet another welcome and exciting addition to the Zambian visual arts arsenal. “Munandi” means friends in Bemba, let us hope these friends will be around for a long time to come.